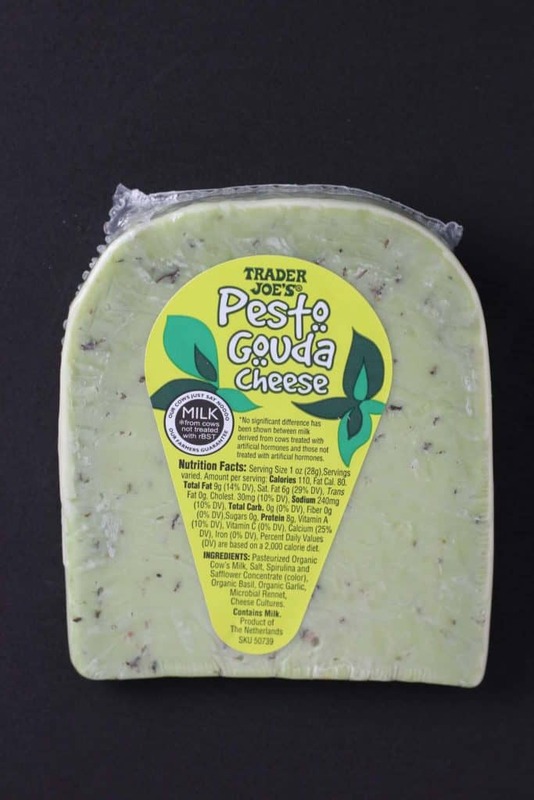 The pros: Trader Joe’s Pesto Gouda Cheese looks different and tastes different. It is also an eye catching color. The cons: This pairing does not work well. It will go moldy quite quickly as well. The verdict: Don’t adjust your screen. 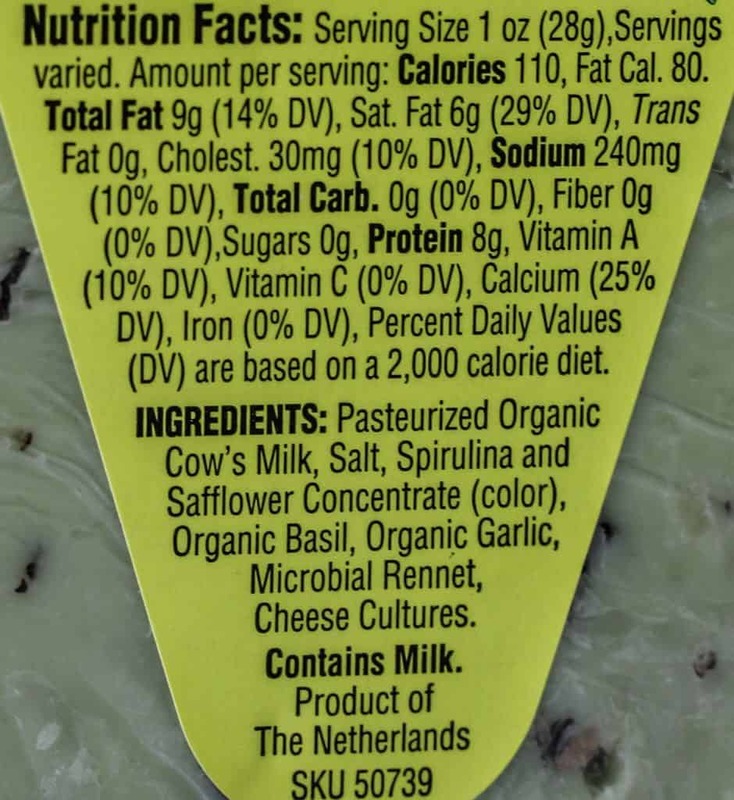 Yes, this cheese is green. On purpose. It’s not mold either. Nope, this cheese gets its distinct hue from the natural colorings and pesto. However, in a few days this too will go moldy. But the mold will be of the white variety. 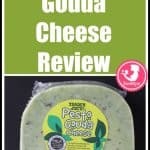 If you are a fan of Trader Joe’s 1000 Day Gouda, then you might be quite disappointed in this product. I adored the nuttiness of that cheese. Even company at Christmas were enamored with that cheese. That cheese had great flavor and texture. So, if that cheese was so well done, then why wouldn’t this gouda be good? A slice of this cheese was all that was necessary. It took only a few bites and I knew this was not that great. In fact, I just don’t like this. There are some cheeses that do very well with an additional flavor. But pesto just doesn’t pair well with this cheese. There are just some things that are best left as an add-on. Pesto, mozzarella, and tomato are an amazing pairing. This dried pesto infused cheese does no justice to pesto or gouda. For $4.41 or $10.49 per pound this was a bummer for me. It was neither cheap nor tasty. It is more dried herbs than fresh flavors. The cheese does not have any standout qualities either. So as a pairing it doesn’t work for me on any level. Would I buy this again? No, I would not buy Trader Joe’s Pesto Gouda Cheese again. Wow I’m glad you reviewed this cheese. It intrigued me when I saw it last week but I didn’t purchase it. I seem to have trouble with alot of Trader Joe’s cheeses going moldy fast even after I rewrap them in cheese paper etc. I have given up on the light sliced Jarlsberg (not their brand). Three times now I’ve seen visible mold on it after a couple of days. Hey Dag! I have the same problem sometimes. For me, it seems to be which cheese I grab. That stinks about the Jarlsberg. Thanks as always for stopping by.